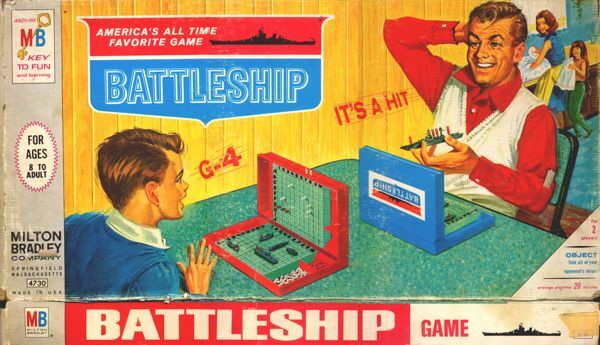 Last Saturday, after viewing THE AVENGERS for the fourth time, my friend and I were having so much we grabbed a bite to eat and returned to the theater again to check out the latest offering, BATTLESHIP. This movie is in fact based on the popular board game from “back in the day” but with an extra-terrestrial slant. Taylor Kitsch plays Alex Hooper, a guy whose juvenile shenanigans leads his older brother, Stone (played by TRUE BLOOD‘s Alexander Skarsgard) to direct him to the US Navy. I’m not exactly sure how the Navy figures out its ranking system but somehow Alex goes from being captain of the Naval soccer team to a full Lieutenant within a year. This is particularly amazing since he has also established himself as a monumental screwball who never gets a chance to ask Admiral Shane (Liam Neeson) if he can marry his daughter because he’s too busy being reprimanded by him instead. As it turns out, this is the least of his problems! Elsewhere in Hawaii…a group of scientists had sent out a homing signal in an attempt to establish contact with a distant planet that was deemed “Earth-like.” I always thought these signals were invisible but, according to this film, they are more like SUPER lasers that blast from Earth like the one emitted from The Death Star when it was trashing Alderaan. Unfortunately they manage to crank call the wrong aliens who, now alert to our existence, decide to launch an attack. 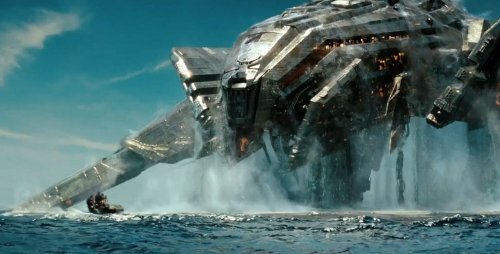 The alien ships are total TRANSFORMERS rip-offs and them standing toe to toe with an old school Naval blockade seems as uneven a match as COWBOYS VS ALIENS but with much less entertaining results. This movie was, in many ways, a Scy Fy Channel TV movie tossed on the big screen. Cheesy dialogue as well as characters secondary to too much CGI-candy. In fact there are so many CGI explosions in this film that the viewer becomes desensitized to them by the end (assuming your still in the theater). At one point, the film plot does mirror the actual vintage game its modeled after but its so darn obvious that it incites laughter as opposed to nostalgia. The film boasts pop/R&B princess, Rhianna, who makes her big screen debut. Suffice it to say, her Grammy Award shelf is in no danger of being invaded by “Oscar.” In her defense, however, she isn’t given much to work with. The dialogue is straight out of a can and even the great Liam Neeson does so much work concealing his Irish accent, he manages to create an entirely new one! The film does show a lot of respect for the US military (a rarity in Hollywood these days) I just wish that the overall material could have been equally as complimentary. Instead you sometimes feel you’re watching a 1940’s Naval promotion video that’s every bit as convincing in today’s world as “Duck n Cover!” This movie also features real-life WWII veterans as well more recent soldiers such as a man who lost both his legs in a 2007 roadside bomb. Prior to the events of this film, he also lost his will to live but, like Lt. Hooper,soon discovers that there’s nothing like a good old fashioned alien invasion to help you put life into perspective! Better to go to the theater and watch THE AVNEGERS a 4th time than BATTLESHIP for the first! 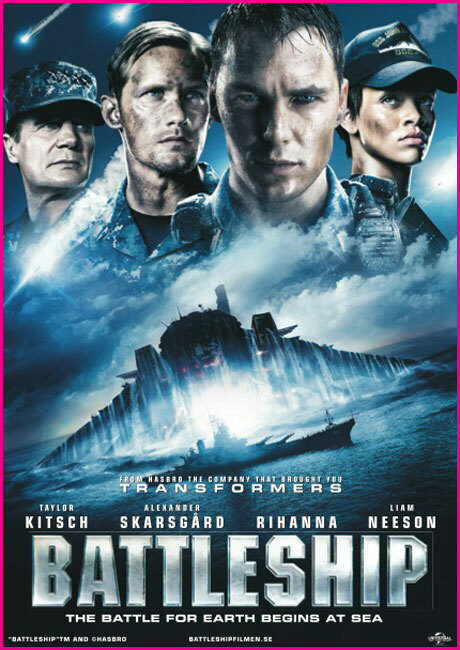 This entry was posted in Movie Reviews, Science Fiction and tagged Battleship Game, Battleship Movie, Rhianna. Bookmark the permalink. ← The Universal “Shock Package” of Films and the Creation of TV Horror Hosts!